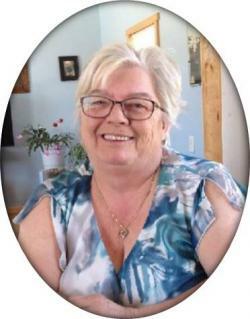 Della Grace Hetherington, 71, of Havelock passed away Wednesday, January 30, 2019 at her home. Born in Cornhill, she was the daughter of the late Harry and Evelyn (Voutour) Baskin. Della enjoyed a friendly game of cards and she loved spending time with her family. She was a member of the Royal Canadian Legion Branch 86, Havelock. Survived and sadly missed by her husband Raymond; daughter Donna Landry (Rodney), Riverbank; grandchildren Jeffrey Garnett and John Garnett (Kate); three great grandchildren Lucas, Taliyah and Gunner; step-sons Peter and Timothy; sisters Dori (Myron), Doreen, Judy (Danny) and Edna; brothers Glen and Bruce and several nieces and nephews. Predeceased by her son Paul; sister Irene and three infant siblings. There will be no services at this time. A graveside service at Pine Grove Cemetery will be announced later in the summer. Arrangements are in the care of Salisbury Funeral Home, 3350 Route 106 Salisbury (372-4800). If desired, donations to the Huntington's Society or the Havelock Legion Branch 86 would be appreciated by the family.